Make connections between our curriculum and the MAP testing then decide how we will use the data to improve learning. To reflect on the primary math program and make any needed changes. To strengthen the ties between boarding and academics. To look at digital options to improve communication and sharing of learning through an online platform, as well provide students with the skills and information to become responsible digital citizens. To look at the school systems for secondary students with respect to increasing involvement in service and other activities; providing needed academic support and developing student responsibility. Over the course of the year, the educational staff, with support from other members of the community, will be looking at these to clarify what we do well and make recommendations for areas of improvement. If we teach students that it is important to be reflective and life-long learners, then we must be willing to demonstrate this and not just say it. As the different groups looking at these areas progress through the year, we will keep you updated. The Farmers’ Market will be this Friday the 21st leading up to the 24-Hour Run. Come at 11am to stock up on all the healthy food needed to keep you moving for 24 hours. 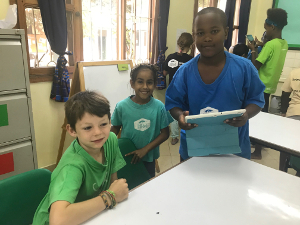 This week, the P4-P6 students completed MAP tests in Reading, Language and Mathematics and, over the next two weeks, our MYP students will do the same, with some students also completing a Science test. The aim of testing students in this way is to make learning visible. The intention is to measure where students currently are in their knowledge, skills and/or understanding in particular areas and use this data to inform where to take them next in their learning. One of the added benefits of the MAP tests is that they allow teachers to track and consider growth over time and, ultimately, over multiple years. As educators, by unpacking and understanding evidence of learning across our school, we are able to respond and adapt our practice to improve learning. However, it is important to note that data has no use or meaning beyond that which we accord it. This year, we have created a dedicated group of teachers from across the school sections who will collaboratively explore, analyse and interpret the data and, hopefully, turn it into actionable insights. Their findings will be shared with the teaching faculty as a whole and, from there, teachers will be able to use the data to help confirm and identify strengths and areas of development for their students. At the same time, we are mindful that these tests are just one way of ascertaining an idea of a student’s current understanding. Any data collected by a school must be triangulated and considered alongside other data, teacher observations, anecdotal records and so forth. It is important to bear in mind that these tests only provide a snapshot of how a child has performed at a particular time on a given day, a useful snapshot certainly, but something that needs to be looked at alongside other data sources and not in isolation. was spent trekking down the western slopes of the mountains where we encountered blooming wildflowers, gushing waterfalls and friendly village residents. 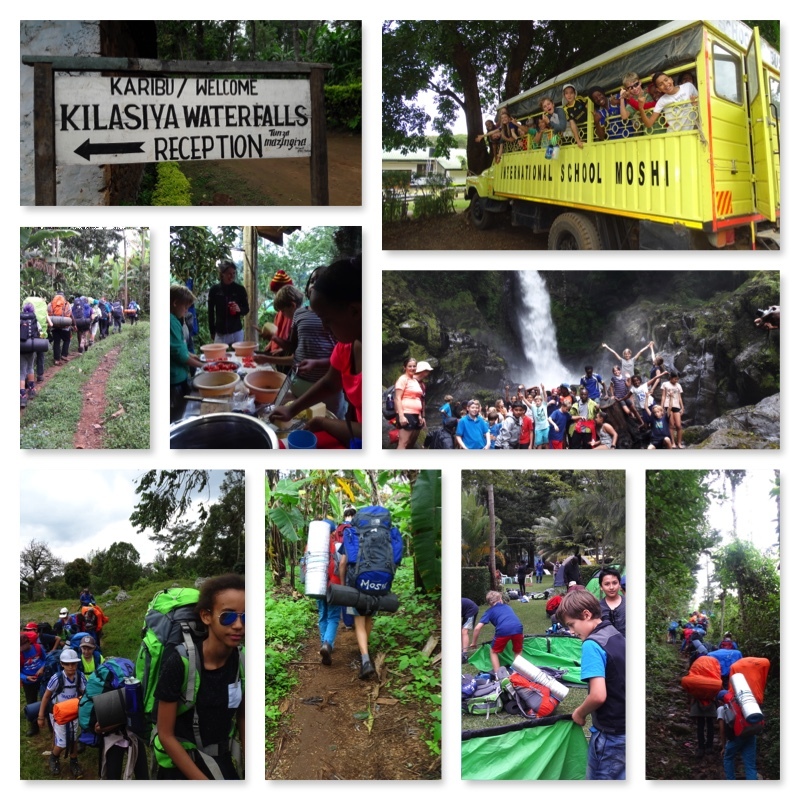 After 6 km of hiking, the group joyfully reconnected with the lorry and headed back to campus, eager for our next OP adventure. This weekend we are hosting the first NTAA tournaments for the year. We have teams in the U15 basketball and U19 soccer and wish them all the best in the 3 tournaments they will compete in to hopefully be crowned Northern Tanzanian champions. I hope to see great sportsmanship, competitive games and lots of support on the sidelines for our teams. 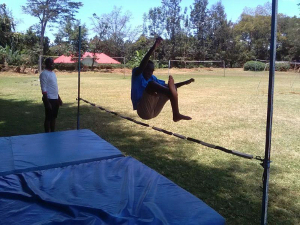 We also wish our Primary and U13 swim squad best of luck in Arusha as they swim in the first meet for the season. This Wednesday lunchtime will be the first inter house touch rugby competition in the new system we have introduced. There will be 2 competitions one for M1 to M4 teams and one for M5 to D2 teams. So, if you want to watch some scintillating touch rugby come down to the fields on Wednesday to see the house teams in action. We are still reaching out to parents of boarders who had not handed in Parent Consent forms and/or Health forms. 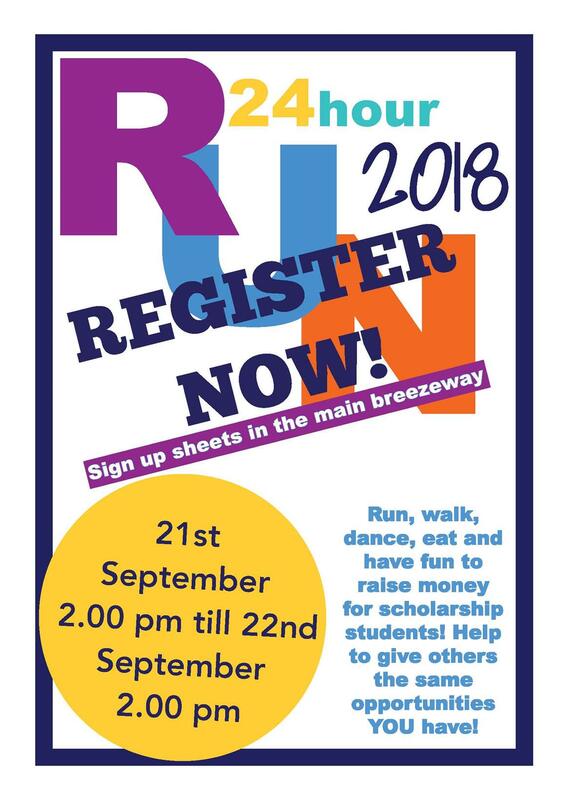 For those parents who have not submitted these forms, it is important that these forms are filled annually, and records updated since situations change. Some boarders may have allergies to different foods and medicines, and it is important that this information is provided to us. Kindly access these forms from our website, complete them and send them to us. It is that time again when we start to make transport arrangements for the October break. The break starts on 5th October, and boarders can leave the same day. They are expected to return to school on Sunday, 21st October for quarter 2. Since the start of this quarter, the M4 class have been studying an integrated unit in science classes entitled Energy and Life. 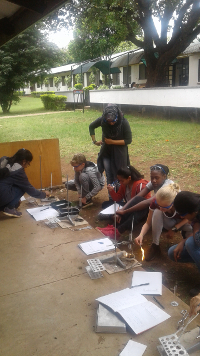 For the practical component of this unit, students are investigating the energy held by various different types of biomass by measuring the heat emitted by these fuels when burned. We have pooled all the data collected by the class for analysis using a google document and in this way, have generated sufficient data for a meaningful analysis and evaluation. Students are submitting their lab report of this practical in sections over the next 3 weeks. Details are available on Managebac. Well done to the P4s for their wonderful presentation during gathering. Thank you to Ms Mary for taking the P4s through lessons about the “dje-mbe” drum which they used for the sharing. On Monday, 17th September we will hold a whole school assembly towards International Peace Day. We will not dress up on this day. 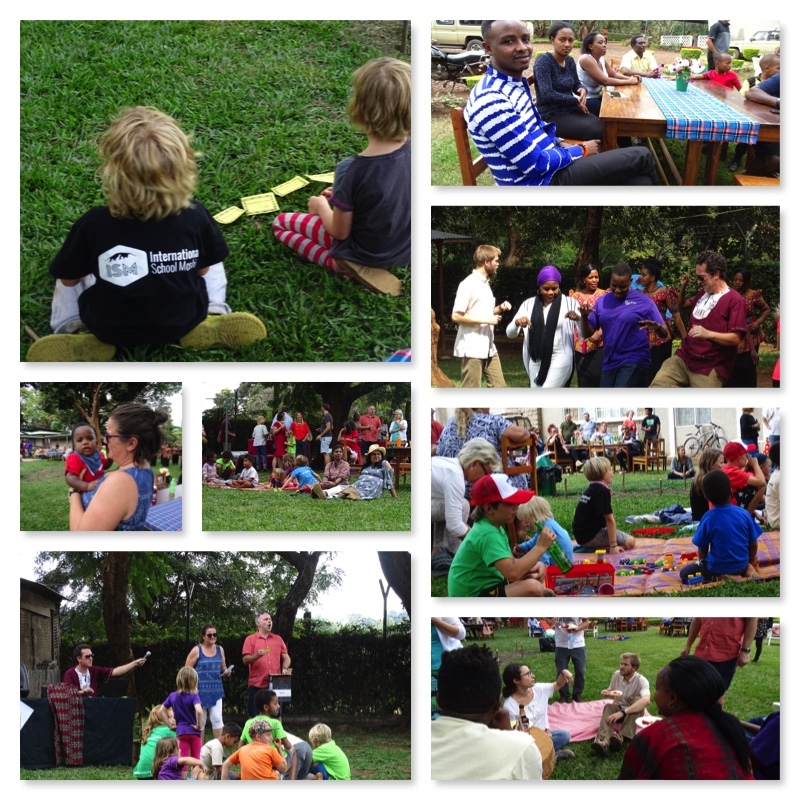 The Peace Day Assembly will be in Karibu Hall, at 7:35am and parents are welcome. On Friday, 21st of September, which is the actual International Peace Day, students are encouraged to dress up in blue and white as these are the colours of the UN. The clothes do not necessarily have to be plain; as long as blue and white is the dominant color it is fine. This means primary children do not have to wear their ISM t-shirts, unless they wish to wear the blue one. What a varied and talented bunch we are in EC. From tree climbers to animal experts, sportspeople to car mechanics, carers to singers… each can describe their own particular strength. Our little garden is coming along nicely. 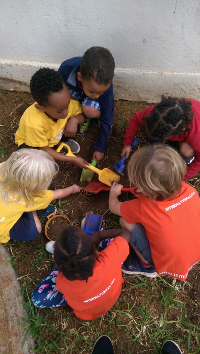 The children were able to use professional tools safely to dig and plant out flowers and passion vines. They decided that we need some pathways through the flowers and we would like to begin thinking about a short day-trip to collect rocks from a local river bed. Let us know if you can join us on this adventure. Next week we will begin to think about babies and the journey each of our children has taken from their earliest days to now. We will start by asking the children what they would like to know about babies, and our inquiry will be guided from this starting point. We look forward to a visit from Eefke’s brother in P2, who took action last week by asking if he could come to present and teach in EC. 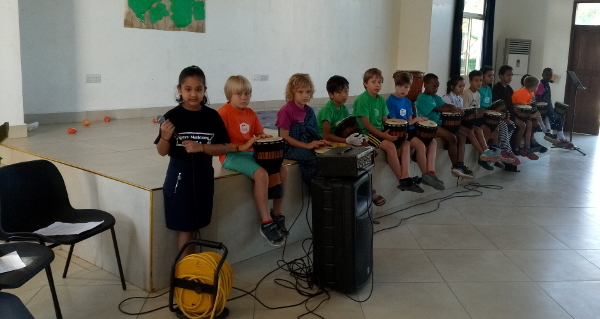 Here we see again the blossoming confidence and varied interests that the ISM eduation and our PYP curriculum supports and nourishes in our children. Do you have any flowers at home that you can dig up this weekend with your child and bring to school? Math talks are continuing to create interesting conversations. Some groups are working on comparing number bonds from 5 to 10, while others are now using their gained understanding to solve some real life problems. Knowing the commutative property of addition (3+5=8 and 5+3=8), has really helped the children make quick links with solving problems. You can pass by and take a look at our pictures. What kind of number sentences or stories can you create from our pictures. Next week, we will continue with our investigations on number stories but look at missing numbers such as 4+_=9. What do you do when you have a problem with your friend? Do you pout, cry, scream or look for another solution? We have been thinking about these solutions this week. Together, we created a wheel of choice to help us think about what to do. Please share some of your strategies at home so we can add them to our bank of ideas. This week in P2/3 we have been working on our number sense, more specifically, on place value. P3 students have been learning to read 3 digit numbers from a hundreds, tens and ones grid, while P2 students have been looking at what 2 digit numbers mean. Students have begun working in their reading groups, which will continue throughout the year. Reading books will be sent home on Fridays and are needed back on Monday so we can continue our guided reading groups. Students have been introduced to GMO crops while reading George’s Marvellous Medicine, followed by a closer look at the advantages and disadvantages of GMO crops. In writing this week, students used a comic strip to illustrate a story about germs that took over their teacher’s body, students used the prompt to illustrate and create a short story. We have also spent time in P6 this week where our buddies taught us how to use SeeSaw to showcase our work. A quick request to please check your emails for information on Peace Week and the assembly on Monday morning. The P4s did exceptionally well this week; they worked on map tests, practised for Gathering and prepared for the Peace Day assembly coming up on Monday. In the coming week we will be looking at writing personal stories of people in our communities. Parents are welcome to share some things that know one knows about you. It would be interesting for the students to guess something about the parents or staff at ISM. In Maths, we will be reviewing the concept of time. We will continue with work on the number system by looking at fractions and decimals as parts of a whole number. We will also start having discussions about our Summative Assessment. This week flew by quickly! Today we were lucky, and we had a guest speaker, Mama Townes, who shared some slides about the Civil Rights movement in the South of America. The class will show off their protesting knowledge next week at our Monday Peace Day Assembly. They will also perform 2 short skits to introduce the Peace Tray to our school. If you are able, please join us at 7:40. If you would like to join our Peace March please be here at 7:30. MAP testing is almost done, and the class did a great job showing respect for their classmates when they finished. We will use the data from the reading to help determine reading groups. The class was assigned their math groups, and we will begin rotations next week. Please remember a water bottle daily. 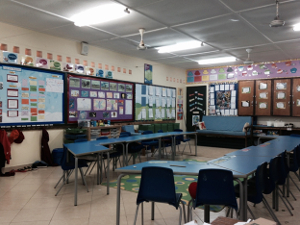 Enjoy a peek inside the classroom. 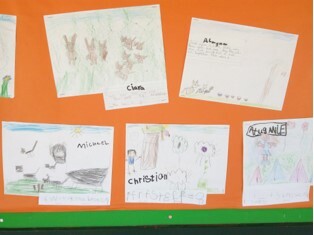 With your childrens’ work on the wall, it is coming together nicely. returning to ISM on Friday lunchtime. Students will check out items from the OP store on Wednesday.